#BlackLivesMatter Has Divided America. It Should Unite it. The #BlackLivesMatter movement continues to divide America, but it shouldn’t. Politicians on both sides of the spectrum have shied away from addressing police brutality against black people. Few have endorsed #BlackLivesMatter, advocated for change or outlined a detailed plan of action. US president Barack Obama and Democratic nominee Hillary Clinton have acknowledged the tragedy of recent events and called for better relations between police and the black community, but they’re yet to propose concrete solutions. Meanwhile, Republican presidential candidate Donald Trump recently claimed black people were “only hurting themselves” after a black man gunned down five police officers in Dallas, Texas. Although he vowed to “protect the LGBTQ community” during his speech at the Republican National Convention, he didn’t express support for the black community. Many Republicans refuse to even acknowledge there is a problem with police officers’ treatment of black citizens; they only focus on the bravery of the men and women in blue and their deaths at the hands of African-Americans. 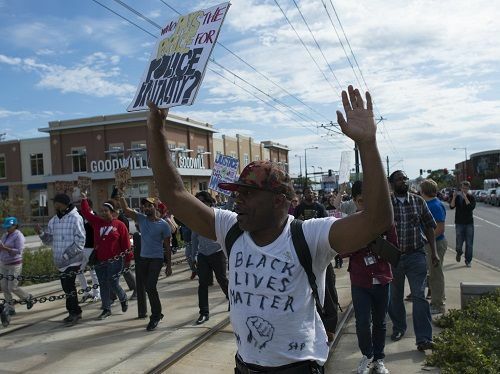 The lack of high-profile support for #BlackLivesMatter at least partly reflects its name. Many people react with shock and outrage to the rallying cry that ‘black lives matter’; they respond that ‘all lives matter’. Another reason may be that the movement makes non-blacks feel excluded. And some may be embarrassed that a shameful part of America's history - racism against blacks and their treatment as second-class citizens - is rearing its head and clamouring for their attention in such a loud, forceful manner. Racial issues in the US have been overshadowed by other, ‘more important’ issues for years. But members of the #BlackLivesMatter movement are unapologetically brash in demanding respect for the lives of black men, women and children. They should be: raising awareness of threats to the lives and liberties of black people outweighs any discomfort they cause to other segments of society. The recent shootings in Dallas have disproportionately tarnished #BlackLivesMatter. A select few members yearn for retribution, to punish police for their senseless killings of black people, but the vast majority simply want a peaceful resolution. The attacks were also poorly timed: the Facebook live stream of the fatal shooting of Philando Castile, a licensed gun owner, caused near-universal outrage but the narrative shifted after the events in Dallas. Vengeance against police officers is unconscionable, but it’s also inexcusable for black people to be victims of systemic racism and fear for their lives during a routine traffic stop. The black community has risen up to demand change and defeat injustice in the past. But without the likes of Martin Luther King preaching the virtues of peaceful protests, further violence could be on the cards. #BlackLivesMatter has never meant that only black lives matter. It exists to highlight the troubling perception that black lives are inferior to others, and emphasise that they matter just as much. Countering that message with ‘all lives matter’ misses the point entirely. Only black people are being targeted, humiliated, beaten and killed by the police on such an immense scale. Only their lives have been taken without repercussions for their killers, even when video footage leaves no doubt about their innocence. Resolving the situation will require people of all races, genders and creeds to recognise that systemic racism exists, take a stand against police brutality and cease viewing #BlackLivesMatter as divisive. Even if some of its members appropriate the slogan to incite violence against police, the movement’s goal will remain just and should be universally supported. Allowing #AllLivesMatter a place in the public discourse will only slow progress. For more interesting stories, follow Convershaken on Facebook and Twitter. Build-a-Bear Fears a Repeat of Its Chaotic ‘Pay Your Age’ Deal. It Shouldn't. George H.W. Bush Showed Strength and Restraint. America's Missed Him. Levi’s Plans To Go Public. It's Perfect Timing. Michael Bloomberg Donated $1.8 Billion to Johns Hopkins. What a Shame. YouTube is Betting Big on Education. It Should Buy MasterClass. Trump's Treatment of Jim Acosta is a Travesty. Past Presidents Weren't Much Better. Bill Gates Transformed Computing. His Greatest Legacy Might Be A Toilet. Trump Plans to End Birthright Citizenship for Illegal Immigrants. He's Right For Once. Copyright © Convershaken. All rights reserved.